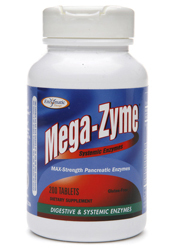 Mega-Zyme® enzyme formula, by Enzymedic Therapy, provides the highest potency pancreatic complex available to support the break down of fats, carbohydrates and proteins in the lower intestine. Mega-Zyme® contains 10X full-strength, undiluted pancreatic extract for optimum natural advantages. The enzymes in Mega-Zyme® are most similar to your body's own natural enzymes. Ingredients: Pancreatic Enzymes 10X (325 mg), Trypsin (75 mg), Bromelain @ 2,400 G.D.U./g (17 mg), Amylase (10 mg), Lipase (10 mg), Lysozyme (10 mg). Contains no sugar, salt, yeast, wheat, gluten, corn, dairy products, artificial coloring, artificial flavoring and preservatives. This product contains only natural ingredients; color variations are normal. Suggested Use: For digestive relief, take 2 tablets before each meal. For support of the body’s natural anti-inflammatory response, take two tablets between meals. Mega-Zyme® is manufactured by Enzymatic Therapy, Inc., a highly reputable supplement manufacturer that is an FDA-registered Drug Establishment and an AFSI-certified producer of particular organic product. Note: If pregnant, nursing, or taking prescription drugs, consult your healthcare practitioner prior to use.